For a movie that did so much filming in full view of the public Suicide Squad has been remarkably good thus far in keeping us in the dark on a number of topics. One of those is the role being played by True Blood’s Jim Parrack. Now we have some confirmation of who he will be. Parrack will be playing Jonny Frost. As has become common these days, the news comes from a social media post that probably should not have been posted, but Batman News found the Instagram post from actress Corina Calderon, who has a brief role in the film. Her caption gives away the Jonny Frost info revealing her 'boy Jim Parrack playing #JohnnyFrost". The post has since been deleted, making it clear that she said something out of turn. How many leaks would never happen if it weren't for social media? For those who aren’t familiar with Jonny Frost, he’s one of the Joker’s henchmen in the 2008 graphic novel Joker written by Brian Azzarello and illustrated by Lee Bermejo Frost. 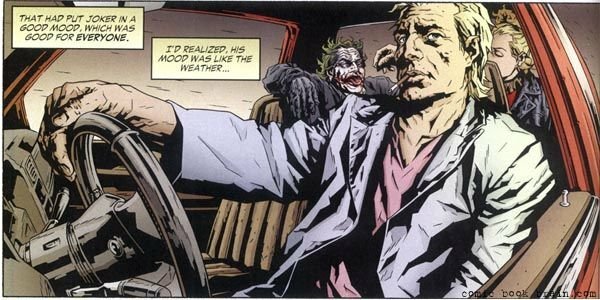 In the book Frost is the Joker’s chauffeur who gets the clown prince out of Arkham Asylum and then assists him on his reign of terror. While the film version of Frost could of course be anybody, one assumes there is at least some inspiration taken from the graphic novel. Here’s a look at Joker’s top guy. This contradicts previous rumors that Parrack would be playing Deathstroke, although he was far from the only one who’s name has been thrown around for that role. Fellow True Blood star Joe Manganiello’s name was once attached to the role, although most recently attention has been focused on Scott Eastwood to play the part. So now we can officially remove Parrack from the list of potential Deathstrokes. Frost should still be a good role though. Anybody who gets on the Joker’s good side tends to be a colorful character. Both Parrack and Leto have a tendency to get deep into character. The former True Blood actor actually drinks human blood, or at least did at one time. And Leto, well he’s just been scaring the hell out of people on set. These two were made to hang out together. We’ll get a chance to see Jonny Frost and the Joker on screen together when Suicide Squad hits theaters August 5, 2016. What If Joaquin Phoenix Isn't Playing the Real Joker?